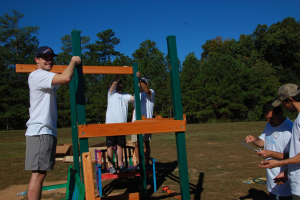 35 volunteers from Wasserman Media group met at PAVE SE Raleigh Charter School to assemble a new swing set and playground equipment, organize the school library, assemble a vegetable garden, rehabilitate the soccer field, assemble and paint benches and picnic tables, and created blacktop games. 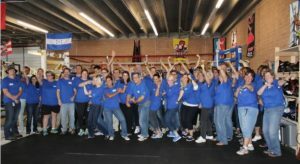 49 Volunteers from MERZ R&D spent their day of service at Haven House Services. These hardworking volunteers help to beautify the building inside and out by painting a “peace” mural, weeding and mulching the flower beds, cleaning spaces inside and out, creating a peaceful meditation room, and making healthy snack kits for teens in crisis. Ready to plan your own off-site project? Request a proposal today! 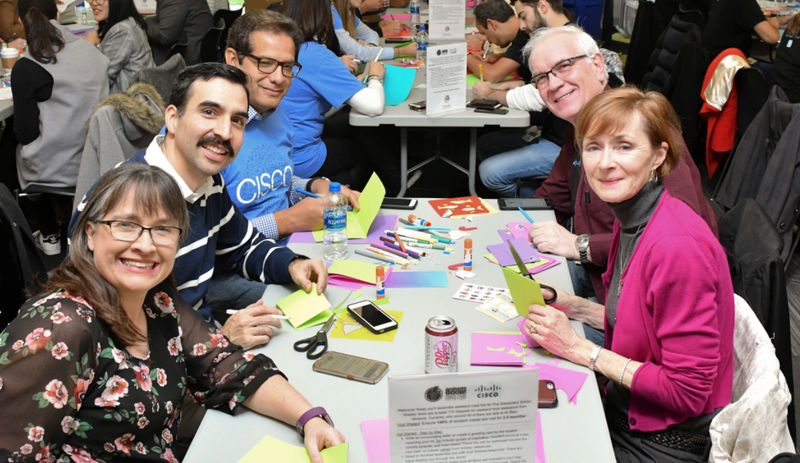 Did you know your team can volunteer without ever stepping foot outside your office? 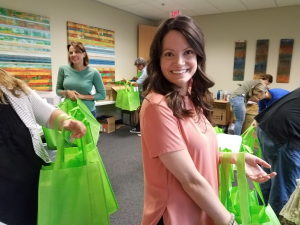 Have a conference coming up and want to give back without leaving the building? Check out some of the projects we’ve coordinated! 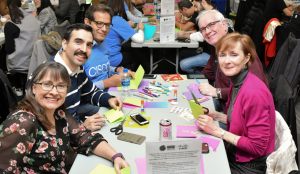 170 Cisco employees worked together to assemble 1400 weekend meal kits, complete with personalized notes, for students in need at Poe Elementary in Raleigh. Poe Elementary receives requests for meal assistance from an average of 170 students per week and these meal kits assured that the school will be able to fill all of these requests for approximately 2 and a half months. To kick of Genworth’s 2017 Month of Service, 55 volunteers dropped by in between meetings and phone calls, on their way to lunch, and whenever they had a free moment to paint. 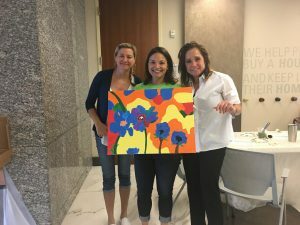 These volunteers created 15 beautiful, unique paintings which were donated to Art for Hospice. Art for Hospice provides artwork to patients at over a dozen Hospice centers, VA hospitals, and nursing homes. Chiesi USA volunteers helped welcome students back to school by giving just 90 minutes of their time to build 550 school supply kits. These kits were filled with notebooks, paints, markers, earbuds, index cards, and more items to help set students up for success. Kits were then distributed to Bugg Elementary where over 75% of students receive free or reduced price lunch. Nearly 300 volunteers from United Therapeutics created a fully furnished “Home for the Holidays” apartment makeover for 10 families transitioning out of homelessness–providing everything from pots and pans and groceries to beds, sheets, dressers, and couches. Everything was customized from within the United Therapeutics offices! Ready to get started? Request a custom project proposal today!